Nour El Sherbini is one of the most exciting female players on the PSA World Tour and has made history at both the World Championship and British Open - the two most prestigious tournaments on the PSA World Tour. In 2009, she became the youngest ever World Junior Champion at 13 years old. She broke in the worlds top 50 at 14 years old and claimed her first Tour title at the Heliopolis Open in 2010. 2015, saw Nour win her first Carol Weymuller Open. In 2016, she won her first World Series event at the Tournament of Champions and became the first female Egyptian to win the British Open. In April, Nour became the youngest World Champion of all time. All these great results vaulted Nour to the #1 World Ranking in May 2016 and she became the second youngest female to reach world #1. El Sherbini won her second World Championship title in 2017 and she went onto reach the final of the 2016/17 PSA Dubai World Series Finals. Annie Au is widely renowned to be Hong Kong's greatest ever female player and won her first Tour title in 2007 when she captured the NSC Satellite No1. 2010 was a superb year for Au as she lifted four Tour titles and became Hong Kong's highest ever ranked player as she broke into the world's top 15. Nour El Tayeb is one of the most consistent female players on the PSA World Tour and a flamboyant crowd favorite, known for her acrobatic diving abilities. She reached the final of the World Junior Championship in 2009 but narrowly lost to compatriot Nour El Sherbini. Her first Tour title came a year later at the Creteil International Open where she became the third youngest Tour title winner after besting home favourite Camille Serme in the final. She finished 2010 in the world's top 20 players while April 2011 brought her second Tour title as she powered past former World Champion Vanessa Atkinson en-route to the Irish Open crown. The Egyptian captured the Atlantis Open in 2012 while 2014 saw her reach successive World Series finals at the Malaysian Open and Hong Kong Open tournaments but she fell to Raneem El Welily and Nicol David, respectively. A fine run at the US Open almost paid dividends after she shocked then World No.1 El Welily. An injury sustained during her match with El Welily resulted in an enforced six-month spell on the sidelines for El Tayeb. El Tayeb made her return from injury in the Naza PSA Women’s World Championship in 2015, where she exited at round 2 against Amanda Sobhy. Chennai-born Dipika Pallikal is one of India's best female players ever and is the first Indian to break into the top 10 in the World Rankings. She started her career promisingly and she reached the final of the Chennai Open in 2008, beating the first and third seeds on the way. Her first Tour title would come two years later when she toppled the top two seeds to claim the Indian Challenger No.5 crown. She started 2011 inside the world's top 30 and won a number of titles throughout the year to breach the top 20. Pallikal made it to the final of the prestigious Tournament of Champions in January 2012 but she was comfortably beaten by Natalie Grinham and in December she found a place in the top ten for the first time. The Indian captured two titles in 2013 with a big win at the Macau Open in October proving a particular highlight. After starring on the JSW Circuit in 2014, Pallikal picked up her 10th Tour title in January 2015 after triumphing at the Winter Club Open. Heba El Torky has made big waves since she first burst on to the scene in 2005. The Egyptian broke her Tour duck at the 2008 Pakistan Open and followed that up with the China Open crown later on in the year. 2009 saw the young Egyptian break through to the quarter-final of the Hurghada Open where she defeated two-time World Junior Champion Raneem El Welily en-route before being eliminated. After a relatively quiet few years on the Tour whilst she pursued a medical degree at the Alexandria University, El Torky returned to winning form in 2014 with three Tour titles to her name including success at the Lagos International event. The Egyptian was hugely unlucky not to win the Sharm El Sheikh International in May 2015 after she narrowly lost to Tesni Evans in a climactic 3-2 final defeat. Mayar Hany made her PSA debut in December 2014 at the World Championships where she reached the first round where she lost out to fellow Egyptian Nour El Tayeb. Born in Cairo, Egypt, she won her first PSA tour title at the Seattle Open in March 2016, Hany beat Line Hansen over four games to clinch her maiden title after overcoming Hollie Naughton, Milou Van Der Heijden and Sarah Cardwell on her way to the final. Hany also finished runner-up at the Australian Open later that year, where she lost out to India’s Dipika Pallikal Karthik over four games. Hany made the World’s top 50 in the PSA Women’s World rankings for the first time in December 2016. Nada Abbas is one of the youngest players on the Women’s Tour and is one of the few members of the PSA World Tour born in the 21st century. Abbas quickly captured the attention after taking huge strides during the first few months of her fledging career and was ranked 67th in the world after less than two years on tour. The Giza-based player collected her first title in April 2016 beating Birgit Coufal in the Harrow Lion Squash Cup – which came less than a week after losing out in her first ever final at the Paderborn Open to Belgian Nele Gilis. The Egyptian went onto claim her second PSA World Tour title at the age of just 16 at the London Open, beating English qualifier Julianne Courtice in five after she battled back from one game down before Courtice took the fourth on a tie-break to set up a decider, which Abbas won as her career continued to go from strength-to-strength. Abbas broke into the world’s top 50 for the first time in 2017. Danielle Letourneau joined the PSA World Tour in 2014. The Canadian finished runner-up in her first final appearance in 2015 at the Livestuff Open when Nele Gilis went onto lift the title. However, the following year Letourneau went on to victory at the Liberty Bell Open to secure her maiden PSA World Tour title when she beat Georgina Stoker. Letourneau then backed this up by lifting the Nash Cup to secure her second PSA World Tour title of that year when she beat Misaki Kobayashi over five games. A handful of runner-up finishes followed in 2017 at both the PSA Women’s Squash Week Open and Charlottesville Open where she lost out to Samantha Cornett and Rowan Elaraby respectively. These high tournament finishes saw Letourneau break into the world’s top 50 for the first time in her career in 2017. Raneem El Welily has emerged as one of the most skillful players on the PSA Women’s World Tour since she turned professional in 2002. She lifted the World Junior Championship twice, in 2005 and 2007, but would have to wait until 2009 to lift her first senior Tour title when she triumphed at the Heliopolis Open in Egypt. That win helped catapult her into the world's top twenty. In 2011, Raneem won the Carol Weymuller Open. In 2014, she reached the final of the World Championship and in 2015 she won the Tournament of Champions, the Windy City Open and the Alexandria International. Raneem was also named PSA Women's Player of the Year and by the end of the year she became world #1. In 2016, she won the Windy City Open and once again in 2017. Joelle King is the leading New Zealander on the PSA World Tour and has done well to come back from a serious Achilles injury sustained in 2014. She won her first Tour title in 2008 at the North Island Championships and followed that up with three further titles a year later. 2010 was a fine year for King who won the prestigious Texas Open and claimed gold and silver medals at the 2010 Commonwealth Games. She was elevated into the world's top 10 for the first time in 2011 and moved into the top five while also claiming the Macau Open in 2012. A ruptured achilles tendon saw her fall outside the world’s top 50. She won the Australian Open three months later and followed that up by reaching the final of the Carol Weymuller Open in October 2015, eventually breaking back into the world’s top 10 in April 2016. England's Victoria Lust has made strong progress in the World Rankings since she joined the tour in 2007. Her ascent drove her into the world's top 30 within a few years with 2012 in particular proving a good year for the Luton-born player as she picked up the NSA Fall Classic crown with a defeat of Tesni Evans. She then went on to record three runner-up finishes in succession before she would be faced to wait until March 2014 to pick up her next title as she defeated Emma Beddoes to lift the Mayfair Open crown. A solitary title would await Lust in the Abierto Colombiano tournament in August 2015, while she finally broke into the world’s top 20 the following February after prevailing over Nicolette Fernandes in the final of the Granite Open. Lust made the semi-finals of the Netsuite Open but was defeated by fellow Englishwoman Sarah-Jane Perry over three games. Lust did go on to win the Slaight Music and Roundtable Capital Granite Open in January 2016.England’s Lust then backed this up with a win over Millie Tomlinson in the Monte Carlo Classic final in 2016. Millie Tomlinson joined the Tour in 2008 but it was 2014 where her professional career really took off. She caused a storm at the LiveStuff Open in November of that year when she rose from her unseeded position to claim the title, beating first and second seeds Sabrina Sobhy and Kanzy Emad en-route. Tomlinson followed that up with success at the Libery Bell Open two months later and rounded off her 2014/15 season in style by storming to the Dafi Consult Invest Squash Open in June 2015. Tomlinson finished 2015 with a couple of runner-up positions at both the Nash Cup and JSW Indian Squash Circuit Chennai – losing to Maria Toorpakai Wazir and Liu Tsz-Ling respectively before going on to seal victory at the London Open downing Nele Gilis in straight games. England’s Tomlinson began 2016 with victory at the Edinburgh Sports club Open after beating Sina Wall in straight games in the final. The Englishwoman then went onto claim an impressive four titles on the bounce at the Irish Open, Jersey Squash Classic, Harrow Ukrainian Squash Cup and Harrow Ukrainian Squash Cup 2. Tomlinson’s stunning 2016 form continued as she went on to clinch titles at the Victorian Open against Dipika Pallikal Karthik in the biggest win of her career and the Salight Music Granite Open. In 2017, Tomlinson finished runner-up to Nele Gilis in the final of the Irish Open and broke into the world’s top 30 for the first time in the May 2017 World Rankings. 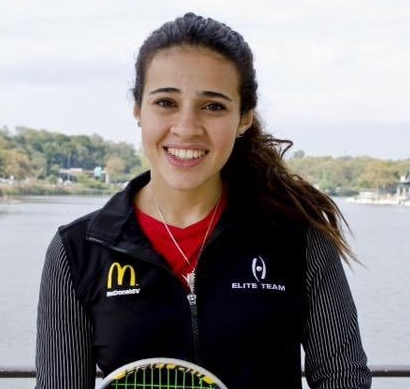 Despite having turned professional a short time ago, Mariam Metwally has already proven that she looks set for a long and prosperous career on the PSA World Tour. After joining the Tour in 2011, Metwally lifted her maiden title in March 2013 at the Swiss Open. She then doubled her tally a year and a half later as she swept to the Open D'Italia crown, beating number three seed Amanda Landers-Murphy in the showpiece final. Metwally narrowly missed out on qualification for the main draws of the Tournament of Champions and the Windy City Open in early 2015 but she did make an appearance at the Alexandria International to end her campaign where she lost to Omneya Abdel Kawy. Metwally made it to the quarter-finals in the Wadi Degla Open in October 2016, where she lost out to Egyptian compatriot Nouran Gohar in straight games as Gohar sealed her place in the semi-finals. Nadine Shahin looks set for a long and prosperous career after making great strides up the World Rankings over the last few years. The youngster had a stunning 2014, winning five Tour titles to cement her position as one to watch in the coming years. Her first title was at the Geneva Open in March of that year where she romped to the title despite starting the event as an unseeded competitor. The Egyptian then won four out of the next five events that she appeared at and was rewarded with a place in the world's top 40 for the first time in January 2015. She racked up four consecutive quarter-final finishes at higher-ranked events to ensure that her progress on the PSA World Tour continued apace. Shahin’s game continued to go from strength-to-strength as she broke into the world’s top 30 for the first time in February 2017 after a handful of quarter and semi-final finishes. She reached the semi-final of the Winter Club Women's Open in January 2015 but threw away a two-game lead to Heba El Torky. Teran then reached the semi-finals not long after of the Abierto Colombiano de Squash Club El Nogal when she was defeated over four games by Catalina Pelaez. Amanda Landers-Murphy picked up her first Tour title at the New South Wales Open in 2011 and she continued her prolific form in Australia by picking up the South Australian Open in 2012. The Hitachi Queensland Open title followed later that year before her fifth Tour crown came at the Australia Day Challenge where she bested Liu Tsz-Ling in the final. The Kiwi claimed her first PSA Challenger 10 title at the NT Open in May 2015 to round off a strong season. Alison Waters has proved to be a fierce competitor since making her Tour debut back in 2000. She lifted her first Tour title at the Forbes Open in 2005 and since then she has been a prolific player at British events. After finishing runner-up in the British National Squash Championships in 2005 and 2007, Waters went on to defeat Laura Massaro in the 2008 final. She lifted another British National Championship crown in February 2010 with a defeat of Jenny Duncalf. That year was a strong one for Waters who broke into the world's top three for the first time as she made the semi-final or better at every event she played. In 2013, Waters won the Carol Weymuller Open and in 2015 she made the finals of the Tournament of Champions. In 2016, she once again made the finals of the Carol Weymuller Open. A hugely successful junior player, Joshana Chinappa is one of the leading Indian women on the PSA World Tour. She became the first ever Indian player to win a British Junior Open title in 2005 when she took the U19 crown. Her first Tour title came at the 2008 NSC Super Satellite No.3 and her second title came just a week later with Low Wee Wern missing out on the title on both occassions. She won her first Tour title in Europe when she triumphed at the German Ladies Open in 2010 and added the Windy City Open to her trophy cabinet a year later, beating compatriot Dipika Pallikal in the final. In 2014 she teamed up with Pallikal to become the first ever Indian players to claim a gold medal at the 2014 Commonwealth Games Doubles event. July 2016 saw Chinappa break into the world’s top 10 for the first time. Chinappa also went onto win the Asian Championship in 2017, overcoming fellow Indian Dipika Pallikal Karthik in the final. She drew a lot of admirers in 2012 and 2013 for a number of impresive performances as she captured three Tour titles over that period. After besting Farah Abdel Meguid in the Konutlari International, Ibrahim went on to secure back-to-back titles at the Sram NSC Series No2 and the Malaysian Squash Tour 8th Leg. Despite suffering something of a trophy drought in the next two years, a number of consistent performances ensured that Ibrahim would break into the world's top 20 for the first time in her career. 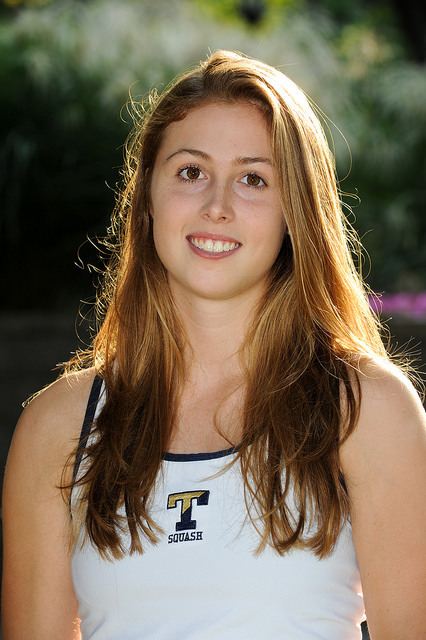 Nele Gilis is the Belgian No.1 and is the sister of fellow PSA World Tour player Tinne Gilis. She has shown herself to be an adept competitor at junior events with the German Junior U19 Open, the European Junior U19 Championship and the Pioneer Junior U19 Cup all going to the youngster in 2014. Gilis narrowly missed out on both the London Open and Edinburgh Open titles in 2014 and 2015, losing out to Yathreb Adel and Fiona Moverley, respectively. In 2016 Gilis marched to the final of the Paderborn Open, falling short of clinching the title as Nada Abbas sealed the victory over three games. The Belgian then went one better at the Open International Des Volcans sealing victory with a 3-1 win over Amanda Landers-Murphy leading her to break into the world’s top 40 for the first time that year. The next year Gilis continued her strong form with a win in the final of the Irish Open over five games against England’s Millie Tomlinson. Kanzy Emad El Defrawy is a promising young Egyptian with a wealth of talent at her disposal. She won her first Tour title in September 2014 and, after a runner-up finish at the Emerson RC Pro Series, reached the world's top 40 for the first time. In 2015, El Defrawy continued to add titles to her collection after she won the Sentara Martha Jefferson Hospital Open when she downed Canada’s Hollie Naughton in straight games in the final. The Egyptian then went onto win the Richmond Open the following year when she beat Misaki Kobayashi over four games after not dropping a game on her way to the final. 2016 then continued to bring tournament wins for El Defrawy as she won the Jordan Squash Federation Amman Open before securing back-to-back titles at the Play Squash Women’s Open and LiveStuff Open. More successive titles were to follow in 2017 when she won the Delaware Women’s Open beating Australia’s Sarah Cardwell over three games before going to beat Zeina Mickawy at the following tournament in the Bahl & Gaynor Cincinnati Gaynor Cup. Milou van der Heijden joined the Tour in 2007 and has come to the forefront in recent years. It took her five years to capture her first Tour title but she defeated a series of home-grown players to storm to the NT Open crown in May 2012. In February 2014 the Dutchwoman won her first Dutch Nationals title and followed that up with success at the WA Open three months later. She was met with further triumphs in 2015 as she retained her Dutch Nationals title and added the Malaysian Tour Squash II crown to her burgeoning title collection. Heijden finished off 2015 with another title after victory over Cryielle Peltier – who she had finished runner-up to one week prior at the New South Wales Open – in the City of Greater Bendigo International. In 2016, she finished runner-up to Hana Moataz at the Grand Sport Armenia 1st Challenger 5. However, Heijden went onto taste more success, this time at the Val de Marne when she downed Julianne Courtice over three games in the final. Another title came in the form of the Jersey Squash Classic the following year when she beat Lisa Aitken to seal victory and another title.